From the Natufian to the end of the PPNB period, a large part of the ritual paraphernalia was centered on mortuary ritual—from the elaborate dead in the Natufian graveyards to the highly decorated skulls and animal/human burials of the PPNB. Seemingly, the dead and the authority of the ancestors was harnessed to support the power of the living—an authority that seems to transform from a nebulous other-worldly spiritual power to a very material relic. 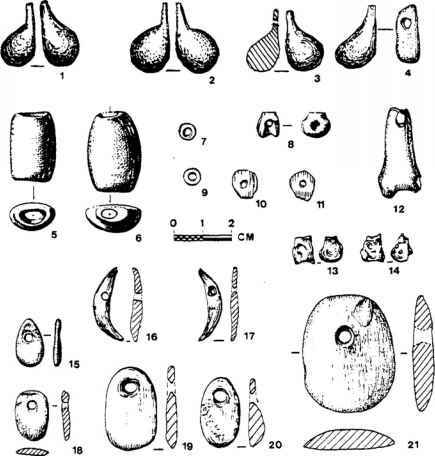 We agree with Kuijt (1996) that these were used in powerful communal acts in the Pre-Pottery Neolithic context, but disagree that these were used as means of social integration. Rather, we believe that the dead and authority of the ancestors served as tools and mechanisms for accumulating power in the hands of those controlling ritual. In each entity, the highly decorated material relic elementwas " . . . finite in quantity andenduring . . . " (Harrison 1992:231)—asin the few highly ornamented Natufian graves, or the PPNB individual skulls selected for plastering and painting. We believe that these highly elaborated relics may represent an original embodying of ancestral power, which later transformed to "elder power" by the Pottery Neolithic, representing a constancy of form and simultaneous transition in the meanings and players (Boas 1955:128;Bloch 1986;Hodder 1984). The wresting of authority from ancestors in ancestral time and its conversion into authority of elders in historical time (Criado 1989), or for that matter the transition from "lapensee sauvage"(Levi-Strauss 1966) to domesticated thought (Goody 1977), is one of the marks of the cognitive change between hunter-gatherer and agriculturist perceptions. The finite but enduring highly decorated element of the Natufian and Pre-Pottery Neolithic mortuary ritual had a specific purpose and meanings, and some of these practices reappeared in the Pottery Neolithic with new meanings. In the mortuary context of the Pottery Neolithic, one finds new variations in the mortuary treatment of children, infants, and fetuses. For example, the burials of children in settlements and fetuses in "womb"pot graves may be another variation of Wadi Raba mortuary rituals: practices that hint at inherited wealth and authority under the control of successful elder individuals and the emergence of social differentiation. As noted earlier, once the restraints ofhunter-gatherer society's norms begin to lift, the pace of social differentiation accelerated, a process that would increase in the later Chalcolithic period. Studies of this and other topics are in their infancy, but we feel that research is progressing sufficiently to allow us to argue that by the Pottery Neolithic period of the sixth and fifth millennia BC elder members of communities controlled ritual, social and economic resource in a way that was profoundly different from that of egalitarian hunter-gatherer communities, as well as earlier agriculturists of the Pre-Pottery Neolithic periods.